Lightning Karts aim to provide the karter with the one thing everyone is looking for, An ADVANTAGE. KNOWLEDGE: Years of racing help us to provide you with the answers you require. DISCOUNT PRICES: Through our larger buying power we are able to pass on the savings on to you. Wether it is through our permanently discounted items or our monthly specials, lower prices mean you have more to spend on other items, or just leave it in your pocket. LARGE RANGE: We endeavor to keep all those parts required to keep your kart on the track in stock. 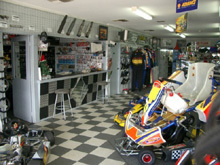 Parts for the popular karts and all the Major brands are available. TRACK SIDE SERVICE: We endever to travel to race meetings around the state as well as major events around the country. Driver training is also available for those looking for one on one assistance. FRIENDLY SERVICE: We realize that karting is also meant to be fun. If you want to be abused you may as well stay at work. Wether you race at a national level or just head out to the track for recreation, you are offered the same level of service and respect. LATEST TECHNOLOGY: Karting evolves constantly so we endever to keep developing our products and services continually. CONVENIENT HOURS: Later opening hours enable you to visit after work.